The Boston Innovation Center, now being built on Northern Avenue, is set to open in the spring. It will be the first structure in Seaport Square. There are lots of ways that the Boston Innovation Center, now being built near the ­Institute of Contemporary Art, could turn into a high-profile misfire. Scheduled to open in the spring, the Innovation Center is supposed to be the central node of what Boston Mayor Thomas M. Menino has dubbed the Innovation District, a neighborhood encompassing the South Boston Waterfront, Fort Point Channel, the Boston Convention & Exhibition Center, and all those vast parking lots in the middle. What could go awry? The Innovation Center’s location on Northern Avenue will be surrounded by noisy, dusty construction for its first few years of operation. The street doesn’t get much foot traffic. The building was cajoled into existence by Menino, part of negotiations to green-light the larger development that will surround it. It has a preset life span of 10 years, after which the landlord could decide to knock it down or replace the Innovation Center with a different tenant. And aside from an on-site restaurant, there won’t be people working in the building on a daily basis and infusing it with energy. Like the first model home erected in a housing development, the Innovation Center will be the first structure in the 23-acre Seaport Square, which will eventually include residences, offices, hotels, and retail space. Most of the Innovation Center’s 12,000 square feet will be devoted to flexible space for meetings, small conferences, classes, and parties. 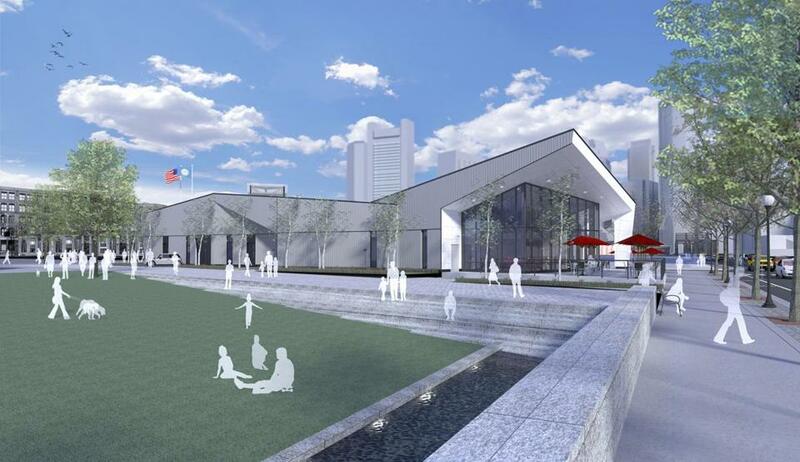 But 3,000 square feet have been set aside for a restaurant, which will generate enough rental income to cover the costs of managing the Innovation Center. In addition, the developers of Seaport Square are footing the center’s construction tab, estimated at about $5.5 million, so there’s no taxpayer money in play here. City officials promote it as the “first public innovation center of its kind.” Tim Rowe, who started the Cambridge Innovation Center in Kendall Square in 1999 and won the contract to manage the Boston center, calls it “a community center for the innovation community.” But how can the building live up to their hopes? The neighborhood’s businesses are more diverse than Kendall Square’s, ranging from financial companies like John Hancock and Fidelity Investments to robotics firms like ­Rethink Robotics to “synthetic biology” companies designing organisms to produce fuel. There are PR firms, e-commerce players like Rue La La, artists, food businesses, and breweries. I’d like to see events held at the center that give people from those varied industries reasons to mingle. So how about the center hosting an evening introduction to synthetic biology for non-scientists? Or a Fidelity fund manager talking about picking small cap stocks? Or a combination beer-tasting/robotics demo? There ought to be opportunities for artists to show their work, and for new restaurants in the neighborhood to serve samples. I love the idea of lawyers from the patent firm of Fish & Richardson showing up to take in a fashion show organized by Rue La La. Since there’s only one venture capital firm located in the Innovation District — OpenView Venture Partners, on Congress Street — the Innovation Center should try to ­attract other investors to use its space, perhaps holding demo events where investors could show off the start-ups they are backing. Dedicating a couple of desks to executives or entrepreneurs visiting Boston from other places would make the center (and the city as a whole) seem hospitable, and potentially help locals forge new partnerships. Conventioneers attending events at the Boston Convention Center should be lured over as often as possible; imagine visiting teachers coming to a showcase of new education technology from Boston start-ups. The restaurant at the Innovation Center ought to be an eager beta-tester of born-in-Boston technologies, like the waiting list management system from TurnStar, or mobile payment technology from LevelUp or Leaf. A possible underground link to the Silver Line’s Courthouse Station would be a perfect place for testing new information displays that help riders navigate the T.
There’s talk of using small chunks of space at the center for what Rowe calls “experimental retail,” and I love the idea of the Innovation Center incubating the next Johnny Cupcakes, Fresh, or Toscanini’s Ice Cream. One project in the works is a prototype “bank branch of the future,” which will hopefully be less boring than the bank branches of today, with their complimentary suckers and slightly stale magazine racks. Finally, there’s the matter of the right name; Boston Innovation Center is just a placeholder, and many in the start-up scene would probably expect (incorrectly) that its primary purpose would be to house young companies, like the Cambridge Innovation Center. On a website set up by the city, wherewillyougather.org, people have suggested names like the Hub Port, the Launch Pad, the Agora, the InnoHub, and 1630 (the year Boston was founded). My suggestion is The Dock, both because the building will be a stone’s throw from the harbor, and also because the technological spin on the word “dock” suggests syncing up, connecting, or recharging. The name will likely be chosen by a too-large committee, or via an online vote, but I’m still crossing my fingers for something non-lame. I’m also hoping Rowe’s experimental mind-set will help the center become a place that amplifies the neighborhood’s energy, rather than a micro-convention center that sits empty much of the time. That will at least make for an interesting decade on Northern Ave.